I’m at a loss to figure out what to do with this window. It’s in the dining room of my Connecticut Antique Farmhouse. The house was built in 1825 and is loaded with antiques– and charm. Well, we think so. I usually have a vision but I’m struggling with this one. I don’t want it to look fuddy-duddy. Back in the day I would have done a swag and jabot, but right now I’m stumped. Should I just leave it naked? Maybe this could be a blog post? PS: By the way, I have enjoyed following you for several years. Not only are you extremely talented and helpful, but you have a terrific sense of humor! Thank you Susan! This is a recent email I received. While I’m at it, here’s the drab dining room. Everything feels so dated to me. How can I give this decor a facelift? I feel like I’m living in grandma’s house. I’m not going for the millennial Pottery Barn house look, but this just isn’t working for me. BTW, when I went to grab the link, just saw that PB is having a MASSIVE bedding sale! However, when I looked more closely, this was from a much earlier email from the fall of 2016 when Susan had sent in a few images from this beautiful antique home! The rest of the photos are how her gorgeous antique farmhouse looks today. And then, we can see if we can help her with that window treatment. My immediate thoughts were that the room is not terribly big, but looks quite heavy with a lot of brown furniture against the pale walls. I LOVE that cache pot and orchid! As for the window treatment, I could see why Susan is struggling. While the room has many things going for it, to me, it feels that the balance is off. In addition, the area rug while very beautiful, is a little too large for the room. The dining room is 13’11” x 11’5” and the rug is 12’1” x 8’8”. Ceiling is 8.5 feet high. Window is 5’10” x 3’6”. However, it’s an old home and the dining room is a little short, so we probably need it to be that long. Ideally, I would like to see at least a foot of wood margin and usually a little more all the way around. My next thought was that what would make this room really work would be a lovely, soft red on the walls as it would balance out all of the brown wood. I used this in a darkish living room once and it is magical! Next up for me is the chandelier. I feel that it’s a little too rustic/casual for the more formal mahogany pieces. Chandeliers are so difficult, so when I find a really great one, I tend to use it again and again. Below is one such chandelier. I think that the 24″ Paris Flea Market chandelier would be the perfect size and style for Susan’s Antique Farmhouse dining room. Above, you can see it in this dining room we did a few years ago. This is such a pretty piece. The photos don’t do it justice. And you can find it at 1800lighting to purchase. Still, I know better than to be giving advice without seeing what else is going and so I asked Susan to send in some more images of the other walls and adjoining spaces. Here we can see the fourth wall and into the living room. Don’t you just love these old floors. I believe that they are pine but they could be something else. I love this shot. This is a very lovely home, but it is falling a little flat in a few places. The first thing I noticed now, is that the color is okay, but it’s creating a drag. However, now that I’m seeing the larger picture, maybe painting the dining room red will feel too much. This here, is the perfect example of why I go a little nutso when someone asks me what color to paint something without being able to see what else is going on. It’s a dangerous thing to do. I would, however, like to see more creamy white in pillows and window treatments. Not solid white, but I feel that the rooms need a little more white– and a little black. And while I am now rethinking the red on the dining room walls, I do think that they still need something beefier going on and that made me think of beautiful Sarah Wagner’s wonderful dining room and wallpaper. I think that something like this Quadrille paper could work nicely and help balance out all of the heavy brown furniture. BTW, have you seen Sarah’s beautiful new blog, Sarita and Gail? Eileen Lonergan helped Sarah and I believe it was one of the last jobs she took. I miss Eileen so much!!! But, she will always be with me. I am thinking maybe a bamboo or some other natural wood Roman shade would be nice in the dining room. Let’s discuss the wall color a little further. Susan says that the wall color is Benjamin Moore White Sand oc-10 but with a little added green to take away the red undertone. And here, I added a little green the white sand image. This is actually quite close to a Laurel Home Paint and Palette Collection color – Niveous oc-36. My feeling with mixing paint colors is that unless you’re fixing a booboo, it is better to get a color that is good without having to manipulate it. I brought this image back down so that you don’t have to scroll back up. I notice that these are the only windows with window treatments. However, the other windows in the living room should also have drapes, unless there’s some compelling reason why they can’t. And, while these aren’t terrible, they are clashing a little, as is the chair fabric. Of course, it could just be the photo. I’ve learned not to trust colors completely in photos! I would do a lighter creamy white and have slipcovers made for the chairs with a skirt. Maybe something like above or it would not need to have the box pleats. I feel that the chairs, while nice look a little too contemporary in this space. But, this is just me being nit-picky. The chairs are fine as is. For draperies, I’m thinking something like this or with a plain ribbon trim. These are by Lynn Chalk. Please check out her page on Etsy for dozens of gorgeous draperies and pillows. Susan said that she bought the lumbar pillows on the club chairs from Pop O’ Color on Etsy which she found here. They are one of the 75 I think it is top sources I put in the vintage and hand-made update on Laurel’s Rolodex last November. She also said that the throw pillows on the sofa came with it and then she added the Samuel & Sons trim which she purchased at Good Goods in Darien. Another idea I have to spark things up would be to add some varying shades of blue in the living room in accents like other pillows will make a big difference. for terrific throw pillow ideas, click here. Here are a few other ideas I put together in this sliding widget. Please click on the individual images for more info. Oh wait, one other idea. It’s the dining room chairs. They can definitely be left brown, but I think that it would be awesome if they were painted a chalky black. It would add another dimension to the room that I think would be quite pleasing. And then, I would add a slipcover skirt. Here are some ideas for that. I very much recommend Karen – The Slipcover Maker. I’m sure that you guys are chomping at the bit to share some of your ideas for this lovely antique farmhouse. I could keep going, but they are all exceedingly minor things. This is such a fabulous home! I think with a few tweaks, it could be a showstopper. Although, it already really is. Before I sign off. As you know, I do moderate comments. Fortunately, 99.9% of you are incredibly wise, thoughtful and kind. And it pains me to have to say this for the .1% of you who aren’t. But, please remember that Susan has graciously allowed me to post her home and she will be reading your words. Please bear that in mind while writing your comments. However, as I have to say about once a month or so, I do not allow nasty comments and unfortunately two people got their subscriptions deleted on Sunday. Not only were they snarky comments directed at me, but they sent them out when I was sick. WTF? Talk about kicking a dog when she’s down. OH! PS: Please go to the newly updated hot sales page if interested in getting a 20% off promo code for Serena and Lily!!! It’s good until February 22nd! I love Susan’s home; it is very much my style of decorating. Thank you Laurel for sharing your decorating wisdom. Hi Laurel, My husband passed away in June, so I have not been able to comment for awhile…. but I just love how you express yourself, both in words I’m in your work— your sparkly personality just adds so much life to every party! I think you really have made this gal happy here! What a great gift that is. I love the idea of switching out the rugs, the bamboo shade and a beefier wallpaper! Your suggestions for the LR are equally cool. Would it be over the top to liven up the opposite wall ( of the DR) with a little more drama on the smaller table top? Not sure what—but it wouldn’t take you long to come up with something.Also, what do you think of a companion bamboo treatment on the French door? Trying to “get back in the swing” here…. What a lot of wonderful ideas, and what a gorgeous house! Our house is a little later, same floors that we’re beginning to uncover beneath teal carpets (mmmm). So far I’ve been painting them, as they would never have been meant to have been exposed. I love them even though those cracks between the boards area home to endless wee dust-bunnies. I agree with swapping the rugs, but then wouldn’t a glamorous chandelier then look a bit incongruous in the dining room with that seagrass mat under the formal dining table? I do think the persian rug would look lovely in the living room, though, and I’d like to see that furniture moved around a bit. I disagree with painting the chairs (horrors!) – I’d rather see them with prettier seat covers with panelled skirts, as Laurel suggests. Georgian farmhouse, and for me that would clash with the honest vernacular of the place. How about a green on the dining room walls? The reds are wonderful at night, a bit painful in daylight, for brunches and lunches, etc. 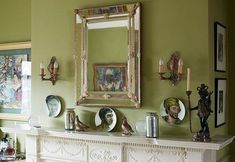 I love Farrow & Ball’s Calke Green, it’s warm and inviting in all lights. Although I love the idea of a cracking wallpaper, too. I’d be leery of too much Chinoiserie, or the whole place might run the risk of suddenly resembling an interior decorating spread from the redoubtable Mary Gilliat, circa mid 70s! I think the empire-esque mirror over the sideboard in the dining room is cracking, but jars a little, for some reason. Could it go in a hall, and have a piece of art there instead? What a beautiful charming home – LOVE those antique wide floorboards. Such History! I agree with some of the other readers who suggested ‘switching’ out the living room & dining room rugs. The dynamic colourway in Suzanne’s beautiful Persian rug would look super in her living room, to enliven the space and harmonize with existing colour accents (blue couch, blue Chinese ceramics & ceramic lamps). Another budget-friendly solution would be to add some additional sofa pillows (in coral and/or chinoiserie pattern). I am visualizing “Ralph Lauren’s English Country Style” Manor Home. A harmonizing mix of colours & patterns all jumping off those found in the Persian rug. As for Suzanne’s dining room, re-positioning the existing living room sisal (if dimensions permit) would look quite fresh against her existing dark wood furniture while visually adding more lightness to the space. Perhaps painting the upper walls in warm soft, golden paint colour (instead of red) in conjunction with (off-white) painted wood paneling onto lower walls for more architectural interest. If Suzanne is wishing for less formality, breezy linen drapes (in neutral/soft white colour) and (neutral/soft white) linen/cotton chair seat covers will add soft romance without jeopardizing the lovely daylight streaming into the room. In the evening, candle wall scones would further add lovely accents to the space. This post came at the perfect time. I’m dealing with the polar vortex that hit Chicago so I’m stuck in the house. I suppose I could be cleaning a bathroom or something but that’s no fun. I have enjoyed reading all the comments as much as the post itself. I love your suggestion regarding replacing the chandelier. And the red toile wallpaper. That room would really be spectacular! When I first read the post I thought a relaxed Roman shade would be lovely in the window. And I would recover the chair seats. It’s an easy DIY project that could be done in an afternoon. Well, I’m late in commenting, but I also think switching the rugs might help, and I’m wondering why the living room is so empty. I’d like to see the other side of it; otherwise, I’d move the chairs into a conversation group with the sofa, as others have said. More color, more lightness, as all have shared. What a wonderful post! So many ideas generated! All interesting and clever and unique! I especially noticed some of the art work, particularly the prints that are either antique birds and/or botanicals framed with an interesting red matting along with cream matting. I would love to know more about the prints and what was used for that “textured” red matting. Bring red carpet into living room? Definitely some bright colorful pillows! I had my Mom’s dining room table and was very attached to it, so I tried to update it and have something more fun…red did it for me! The first thing that came to mind is to paint the chairs, so good idea. Speaking of red, I would do the first wallpaper shown on the ceiling. That will be less busy and will add drama to the room. The chandelier doesn’t bother me, depends how formal Susan would like to go. I would do a Roman shade in the dining room with a beautiful fabric to works withe paper. Thank you Susan for sharing your home, and thank you Laurel that invited us in! Susan, girl, you’ve got some great stuff, and good taste, too. Sometimes I look at the dining room sets our mothers and grandmothers and great-grands cherished, and I just want to paint it all! But I don’t think I could. If I sent it out to be painted, I think I’d have to check myself into, well, not a rehab per se, but maybe go on a cruise while it was being done. Sister Parish was famous for taking the beautiful, nearly priceless antiques she was given as a young bride and painting the hell out of all of them. She started a design trend that was a shock to her contemporaries, but lasts to this day. I don’t want to know what her momma said the first time she walked in after all those dark wood pieces were painted white. I imagine she had herself a conniption. Great post, as usual. I was struck by her comment that it felt like living in Grandma’s house. And then I saw a room full of Grandma’s matchy matchy furniture. I’d leave the walls alone. I would use that red trellis pattern you chose (love!) in fabric for Roman shades on the window and door. Then I’d bring in a complimentary pattern for dresser scarves for the console table and hutch, kicking out that third smallest console (too much!). Then add a table runner to match the Roman shades. I’d leave the rug but definitely cover the chair seats in the complimentary pattern. In the living room, it’s those window curtains. Too beige, I would put a navy blue and white print up there. And Laurel, you’re spot on about the paint color. After the painters finished the first coat of White Sand, I HATED it, so we added green to the second coat to get rid of the pink. It was, as you say, a booboo. What a pretty house to begin with! I love your idea for more color on the walls. I have another suggestion along the lines of wallpaper. Would a scenic wallpaper mural work? ( I mean the kind where there is a landscape or other scene that wraps the room.) It would be in keeping with the antique furniture and you did have some posts about getting wallpaper murals relatively inexpensively. Alternatively, an artist or someone artistically inclined could paint a mural. And you could also stencil–this is for those people who want the designs but don’t want the wallpaper. I’m loving all these comments and suggestions. You’re all quite right about the grandfather clock. It is a family heirloom that belongs in the living room but because of floor vents it ended up in the dining room. I hadn’t considered closing the vent, but maybe I should reconsider. These old houses aren’t well insulated so we can use all the heat we can muster in the winter but beauty first! As for the small print on the other wall, my husband hung it one day when I was out , LOL. I will find a new home for it. (This is a second marriage and the husband came with an Audubon dowry). I’m crazy about the Quadrille wallpaper! What a great suggestion. Then I think I’d do the bamboo shades and the brass chandelier. I love all those wallpapers! I also love when you do posts like this where we can see real homes and imagine the changes you suggest. One of your posts a year or two ago helped me decide on going with a dark paint color in my dining room. You are always so helpful and inspiring…and funny! Hello Laurel, Perhaps what is going on is that the dining room furnishings are Colonial, but those windows with their 2/2 sashes are mid-Victorian, and seem a little coarse-grained with that fine furniture and/or without other window treatment. 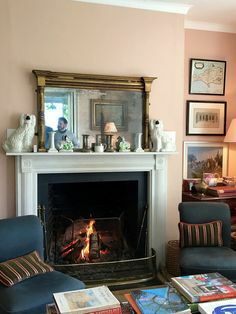 I know it would be expensive to install correct windows, and I abhor those fake grids, but perhaps you or the owner could try sketching in smaller panes (perhaps 6/6 to go with the house’s period, or whatever seems fitting) with Photoshop, and see if it doesn’t help draw the room together. Oh I forgot this is a window treatment question. My vote is to bring the red up; right now the top half of the room is so light and the bottom half is dark. 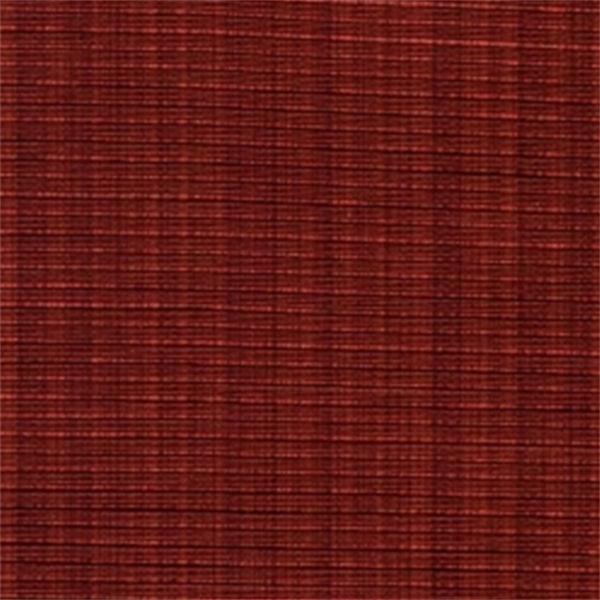 I emailed a lame photoshop of corded reddish fabric. I do have a question but it is more general. I love all your posts and these homes are all so beautiful. I am finding that I could no way live in any of the homes. I feel like there is always too much “stuff” and it would make me feel anxious. Is this a design flaw in my character make up or is it just personal taste? And if personal taste how do I find my style as it is not as if I am drawn to modern minimalist. I do love cozy and hate stark cold. I love the rooms and colors it just the posts tend to look more like a museum than a home. I ask as I am just starting to get ideas for redoing my house and am frozen due to this. I love walking into a well designed and thought out room but the dark colors, art and collectibles everywhere and so much furniture are all overwhelming to me. Edit: there’s a much better photo of the Veere Grenney room on the UK House & Garden mag site, and oops! those plates are red and turquoise rather than brown! You always write great posts, and timely too. I was struggling with a window treatment for a room in our house and got some great ideas from suggestions you gave Susan ! Are there too many chairs around the dining room table making the area darker and heavy? Could two chairs be removed and worked into the living room, maybe one in front of a window or one in front of each window(might be two many pairs in the room)? Then putting the two upholstered chairs in front of the sofa with a small table between them or coffee table? Chair rail in dining room, tone on tone colors? Lighter or hidden curtain rods in living room? Maybe a house plant(s) in addition to the orchid which adds life. Just some puzzle solving attempts on this cold and snowy stay-inside day. Thank you for your blog Laurel. And CT lady for sharing. Great post Laurel. The house is beautiful. You never cease to amaze in terms of your thoughts for a space. I never would have thought of that wallpaper in the dining room but agree it would really bring it to life. Also, when I started reading your sentence on painting the chairs, I expected some shade of white or ivory – love the idea of black. I painted chairs graphite by Annie Sloan and they are great. Thanks again… always look for your post on Sunday a.m. and it was a fun surprise to wake up to one on Wednesday. 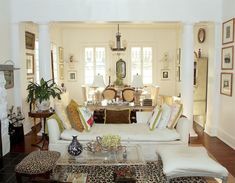 Laurel- I think the idea of adding white (via pillows) into the living room was spot on. The photo you show with the suggested chandelier also shows a blue sofa with similar pillow effect. It would be much lighter and more inviting. Now, these are just my opinions, but … I think they could pull a blue shade out of the dining room rug, and recover the chairs. It would tie the rooms together as well as her blue/white ware on the buffet. I think the red is too heavy and dark. The shade for the window is perfect. I also like the skirt slipcovers on the chairs, with a coordinating table runner to break up the large expanse of dark wood. And really, although beautiful, if she doesn’t need 8 seats on a daily basis I’d take a leaf or 2 out of the table. Put a newly brightened chair on either side of the window, and maybe a pillow on one or both that echos the new ones in the living room. Dear Laurel & Susan, It’s a lovely house, and after seeing the post this morning I’ve been thinking about it. I think there are two questions here which will help to show the way: how is the room used, and are all the furniture pieces antique? (Room use: formal or less so? Antiques: painting the chairs if antique is perhaps not a good idea.) As Susan wants to avoid any fuddy-duddy aspect, I assume this means a less rather than more formal look. Here are my thoughts, but of course they’re dictated by my own taste. When I first started looking at the photos and Laurel’s ideas, I reacted sharply against the red walls idea. To me, this was confirmed when I saw the pictures showing the view through to the next room, after the chandelier comments, with which I entirely agree — much as I love the iron chandelier, the one Laurel proposes goes better with the furniture. The touches of blue in the dining room pick up the blues in the sitting room, and I think this could be reinforced. So another yes to the white curtains with blue trim suggested by Laurel, perhaps in both rooms. My own instinct would be to repeat the look of the sitting room by putting a similar rug into the dining room. (I’m sure the beautiful Oriental rug could go somewhere else in the house.) That implies removing the red upholstery on the chairs (which I think is rather dated, but that view is influenced by all the dreadful cherry-red velvet on gold-brown wood that is so commonplace in rural France). Replacement fabric could be blue, grey or pale neutral — again close to Laurel’s suggestion, although I’d rather see new upholstery than slipcovers. The walls don’t have to be grey, the plates don’t have to be brown, the columns could be trompe-l’œil paint! What a lovely home! I once lived in an old stone farmhouse built in 1776, and they can be challenging. I love, love, love the Qudarille wallpaper you suggested and I think it would be stunning. I had the red walls with the mahogany furniture in. the farmhouse, and it was a bit heavy and dated. 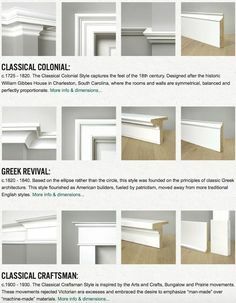 I now live in an open plan neoclassical house, and I am drooling over that picture of the dining room with the fireplace. You are so right about the cream and black accents. We have similar colored walls, toasted almond, with cream slipcovered upholstery, chalk black hutch in the breakfast area, along a couple of black lamp shades that really bring the house to life at night. Susan, I love your home! Laurel, I love your ideas. This is a beautiful home and another blog post chalk full of wonderful ideas. Susan: Thank you for sharing your space! I loved Laurel’s idea about adding a red chinoiserie wallpaper in the dining room as well as painting the dining chairs black and adding some type of slip cover element. I have a feeling if you make those changes you’ll have an answer to your window treatments. I have a historic home in Newport that I’m quickly pulling together for a summer rental. I happened to do something similar that Laurel suggested to the dining room – chinoiserie paper on the walls (blue not red), painted dining set and bamboo blinds. While the room needs some tweaks, it’s a timeless look that’s not too formal. I think you’ll be very happy if you follow her suggestions. As soon as I get the reshoot of photos from the realtor, I plan to be in touch. Love the Canton ware and could see bamboo shades or curtains or fabric shades or recovered chair seats using the vibe of the Canton ware. What about the lonely painting on the window wall – adding another painting or a grouping gives needed visual dimension. I can see why you were tempted to create a blog post on this house. It’s gorgeous! I have some simple suggestions to add…. There is more wall space to the right of the Dining Room window than to the left. Is there another space in the house where the clock could be moved to? Then add side panel drapes (header suggestions, top pinch or inverted pleat) on the window. I see the fabric as a blue & cream print, and would use the same fabric/treatment on the Living Room windows. (Not sure if there should be a treatment on the Dining Room door…hmmm.) There is blue in the Dining Room rug that would tie it together, and it relates to the blue & white cache pot on the buffet. I suggest changing the artwork to the right of the window to 3 smaller vertically aligned pieces, in a size that balances the wall space on the left of the window. Ha! You read my mind Catherine re: clock and window in the DR AND art! So frustrating, but that little wall to the left of the doorway in the living room, I think would be perfect, but there’s a vent in the floor! That won’t work for our antique clock. The only possibility is if that one vent can get turned off. Sometimes there are enough other vents that it’s okay. But, it doesn’t always work out. There’s a formula on the post for the correct size shades. First of all, exquisite and beautiful home! Not to knit-pick but I’m glad someone else noticed the lampshades as also note all appear to be in the family of white. That stated, I feel the addition of a piping (trim) might give at least one, a little more character which is something that the homeowner could apply herself. With respect to another minor detail; perhaps some of the glass for the artwork could be changed to non-glare (non-reflective). Last but not least; totally agree with your suggestion/choice of a new dining room chandelier and Catherine’s suggestion of possibly using inverted pleated headings for the new curtain panels provided they are going to be functional (as will require new hardware). I was also struck by how much brown there is in the room with all the wood furniture. I’m a big fan of chalky paint finishes and can see how painting the chairs might break up some of the brown. Not sure if I’d do both the chairs and another piece in the room, but I’ve used a painted piece as a focal/interest piece in my rooms. Perhaps that buffet and mirror (if not valuable antiques) might be painted a color to brighten the room if wallpaper is not used. Maybe a beautiful blue to bring in the colors from the living room that is seen from the doorways? Agree that the window is sadly off balance on that wall. Consider swapping out that picture for something larger to give that wall some heft. And Laurel, would you treat that door as a window as well and put a valance and/or panels at the same height as whatever is done on the window? Good morning everyone! There are currently 34 comments in the cue, so I will get to your comment shortly. No, you haven’t been banned. It is very rare. Right. Nice problems to have indeed. I agree with your ideas. Yes, the right side needs different art, either two or three smaller pieces or one longer piece. If we could find a different location for the clock, what I would also do is a window treatment fudge with draperies extended further on the right side to make it look like the window is centered and then I’d put art on both sides.